Autos emerging as NAFTA priority No. 1 for U.S.
United States Trade Representative Robert Lighthizer, flanked by U.S. Chief Negotiator John Melle and U.S. General Counsel Stephen Vaughn, took aim at auto as NAFTA talks started. WASHINGTON -- Early indications suggest the auto industry is the potential No. 1 issue for the United States in a renegotiated NAFTA. What's not clear yet is whether it will go from being important to being an irritant. The issue came close to prompting an immediate public debate between the countries on the first day of the talks, after remarks from the lead U.S. official were interpreted by some as floating the idea of a Made in America quota. Both Canada and Mexico pushed back against the idea of an American-made quota in auto manufacturing — the lead ministers for both countries warned of damaging unintended consequences to the industry. Auto production was the issue mentioned first, at greatest length, and in most detail by Donald Trump's trade czar as talks got underway Wednesday. He cited priorities for the sector, designed to boost production of parts in North America, and in the United States. 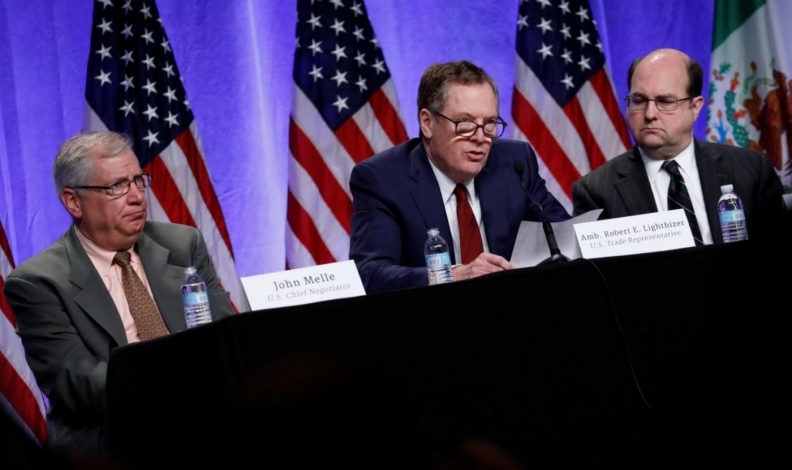 Industry members are warning Lighthizer to handle the matter with care as the details are complicated, and any wrong moves could either drive up vehicle prices. There's also a risk that changes could make North American producers less competitive, or even force them to just ignore the new rules and simply pay a tariff that would be passed along to consumers. A "higher" North American content requirement to avoid a tariff. The current rule of origin calls for 62.5 per cent of a car's parts to be made in North America. "Substantial" U.S. content in cars. It was unclear whether he was advocating a new, specific requirement for U.S. content — a move that would surely be controversial — or whether he was simply stating that the desired changes should positively affect the region, with more cars being made in the United States. Stricter monitoring to make sure companies comply with the rules of origin. Lighthizer said country of origin "should be verified, not deemed." Labour provisions should be included in the agreement and be as strong as possible. Tougher labour standards. Some insiders in Canada and the United States suggest better worker conditions in Mexico, and more pay, would not only be good for Mexicans but also for making non-Mexican production more cost-effective and preserving vehicle production in Canada and the United States. A Canadian auto-industry representative at the talks said he's not worried by what he heard: "There's no anxiety about it with us," said Flavio Volpe, president of the Automotive Parts Manufacturers' Association. For example, Volpe interpreted Lighthizer's words to mean that he's hoping for more production in the U.S. as a spinoff effect of a stronger North American industry, not as a demand that plants move there from other countries. It's also risky to try requiring companies to produce certain products at home, Volpe added: some industries that produce certain types of electronics for automobiles simply don't exist in North America. He said Canadian auto parts companies have 43,000 employees in Mexico. Foreign Affairs Minister Chrystia Freeland pushed back when asked about the idea of a U.S. content requirement. "Canada is not in favour of specific national content in rules of origin," she told a news conference later Wednesday. "We're also very aware of the extreme complexity of rules of origin. It's going to be very important... to take very great care in any changes that are made to ensure they don't disrupt supply chains." Mexico's economy minister, Ildelfonso Guajardo, said: "It's not good for American companies, it's not good for Mexican companies. So I think we should find other policy tools... It would be highly complicated."